A few months ago, I argued that housing was messing up inflation measures, in particular the core CPI. With last week’s release of fresh CPI data, I decided to check in to see if that’s still true. Answer: Yes, but less so. The cost of housing is still rising slower than for other core goods and services, but the gap has narrowed. In my earlier post, I found that year-over-year core inflation through October was a remarkably low 0.6% and that housing costs (as measured by the CPI for shelter) had fallen 0.4%. As a result, core inflation less shelter was 1.3% — low, but not remarkably so. We now have data through January: core inflation has picked up a bit to 0.9% over the past 12 months. 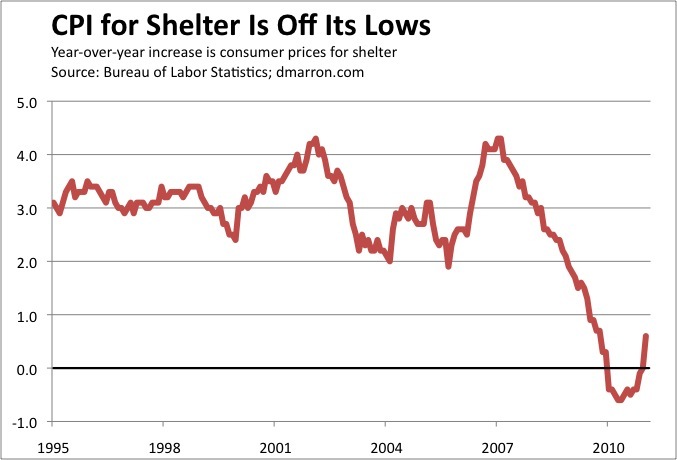 Shelter costs rose 0.6% over the same period, and core inflation less shelter is 1.2%. Bottom line: Housing costs have dragged the core CPI down over the past year, but not as much as was true a few months ago. P.S. My earlier post provides details about the BLS measure of shelter prices. What do you have when you take housing out of the CPI? You can’t deny that housing is part of the cost of living, and you can’t deny that housing prices are affected by monetary policy–albeit with a rather long lag. Loose monetary policy bids up the price of housing and eventually gets into the rents and imputed rents measured by the price index. The collapse of the housing bubble is now keeping rents down, offsetting both the stimulative and the likely inflationary effect of today’s monetary policy, and accurately registering the fact that despite the expansion of the Fed’s balance sheet we are very far from any inflationary inflection point. We strip food and energy from price measures on the grounds (not entirely true) that they are transnational and not as easily affected by monetary policy as other prices; we can’t make the same argument for housing.